“What was the cut-off marks for bsnl jao recruitment 2017 ? What would be the cut-off marks for bsnl jao recruitment 2014 ? BSNL JAO Cut-off Marks – State Wise & Category Wise – The Bharat Sanchar Nigam Ltd. (BSNL) conduct a competitive examination for recruitment to the post of JAO (Junior Accounts Officer) exam almost every year. The selection process for BSNL JAO will consist of (Paper-I & Paper-II). Candidates qualifying in the written exam will be shortlist for final selection. 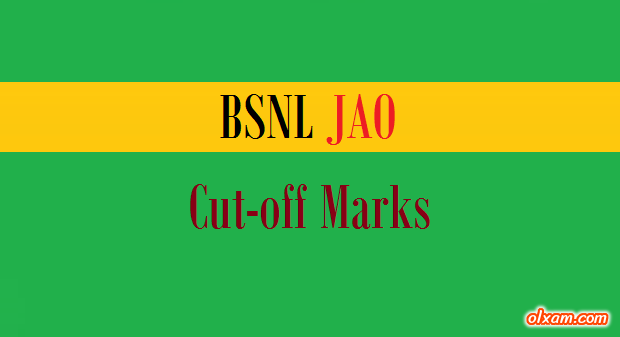 Here in the below table we have listed cut-off marks for BSNL JAO exam 2014. My name is kishor yadav and I am junior accountant at rajasthan and I just want to know that which job is better, bsnl jao or jr acct in raj. JAO is better than JR Accountant. Job Profile, Salary, Promotions, Allowances all would be better with JAO. Will the cut off be decided of individual paper or on combined basis. expected cut off marks of bsnl jao in rajasthan. Rajasthan ki expected cut off marks of JAO Bsnl ki kya hogi. please tell us that when will the result of bsnl jao 2017 result will be declared? BSNL will soon release the result of JAO. May be within 1-2 months. Does bsnl recruit every year for jao posts sir plz tell me. No, Generally after 3-4 years from the latest recruitment. Sir please tell me when the results of jao will declared. BSNL JAO result will declare within 2-3 months after exam. the selection of bsnl jao post 2017 is done on merit basis or they conduct interview for the same? You should contact BSNL office about this issue. sir plz share state wise cut off of bsnl jao exam. 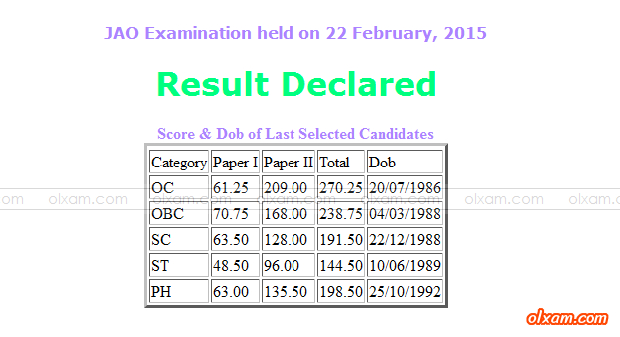 Provided Cut-off for BSNL JAO post is official cut-off provided by BSNL of last selected candidate of each category. BSNL did not provided circle wise cut-off. If we find such we will update here in this post. hello sir please tell me which state have minimum cut off for bsnl jao exam?? i want your advice that from where i should apply i am from up. I would suggest you some technical kind of solution. Some day before BSNL recruited JTO for almost 2,500 post. You must check that result. That result was state wise. You will get state wise competition from there. sir plz suggest me a book for paper II. Sir. For BSNL JAO RECRUITMENT 2017, Can i choose to apply for other circle/ state while appearing the written exam in my circle? You will be eligible for only that circle vacancy for which you are going to apply. Like if you are applying against Gujarat vacancy then you would only be selected against Gujarat vacancies. BSNL JAO is a circle based cadre. sir can u tell me previous year bsnl jao cut off on circle wise.. since vacancies are on basis of circle wise. sir plz tell me cut off for for i paper and second paper compulsory to clear individual . Yes, BSNL may fix minimum qualifying marks for each section as well as in the aggregate.